If you are a long time user of CRM (for Dynamics 365), you’ve probably noticed that there are lots of new ways now of displaying and comprehending information. 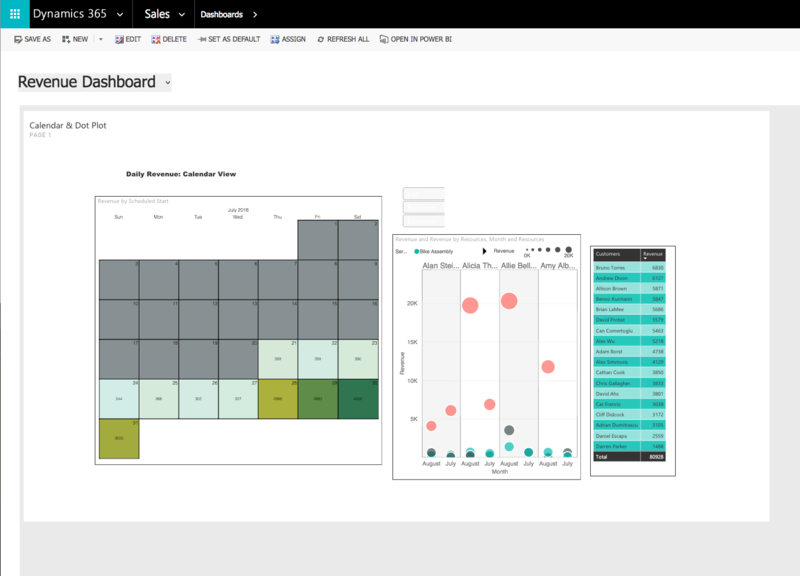 With Power BI’s out of the box integration with CRM, it is so easy to bring in additional visualizations to get more perspectives and insights. Gone are the days of dashboards that consisted only of static pie and bar charts. Not that anything’s wrong with looking at traditional pie and bar charts! In fact, in many cases, simple visualizations are much more effective than flashy “cool” controls, but there are times when information presented in a different format may trigger newer ways of processing information, and in turn, help us with better decision making. One of the controls that was recently introduced in the custom visual store is Beyondsoft’s Calendar visualization. This is one of the simplest yet extremely useful controls that can visually provide important information on how busy (or not) your days are. From your dataset, it looks at one date field (date a sale was made, for example), one measure field (revenue, for example), and a bunch of tooltip fields. 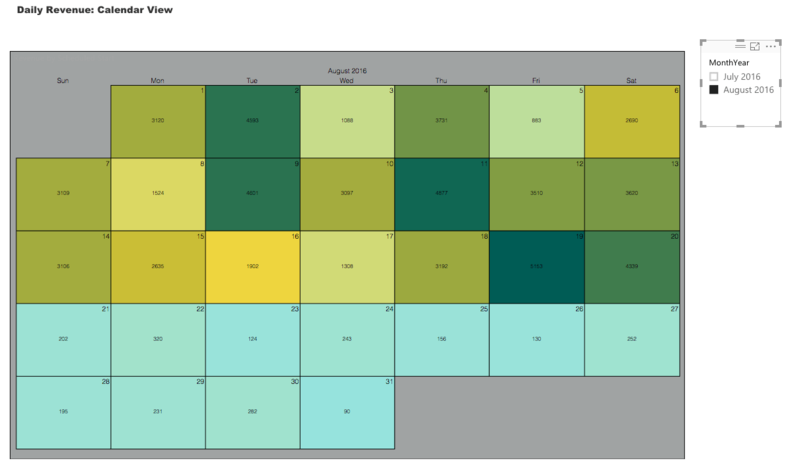 What’s unique about this visualization is that it takes into account the highest and lowest values for a given month, and shades the background color from light to dark. The higher the value for a given day is, the darker the calendar day is. You see what I mean? In one quick glance, you can tell that the 2nd, 9th, 11th, and 19th, were super busy. In fact, 19th was the busiest. Also, the first half of the month was the busier than the second half. The gray in this month’s view indicates no numbers. Another way of seeing that the beginning of the month, we had no business (GASP! ), but then it picked up on the 21st, and got really busy by the end of the month. 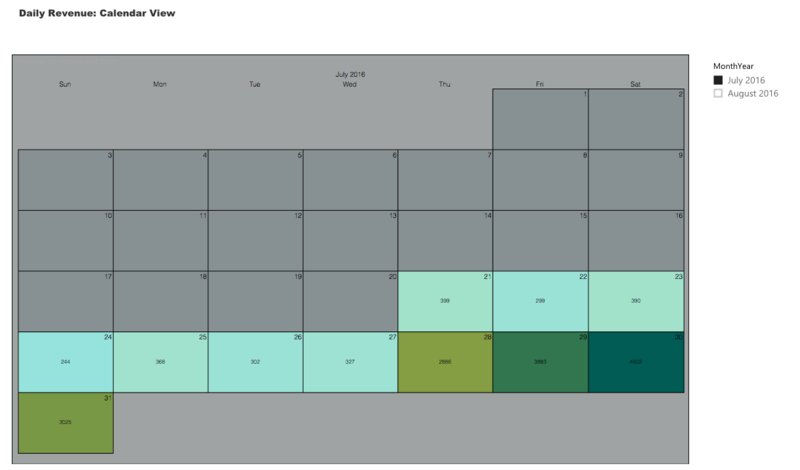 First, you add the Beyondsoft Calendar visualization from here. Once you have it, drop the visualization on the canvas, and add your date and measure fields. Next, set the colors for the “spectrum” under the Format tab. Feel free to change other formatting values, but essentially, your calendar visualization is ready! Well, it’s for everyone. Here are some examples I can think of. Businesses that track daily sales. A bike shop, coffee shop, restaurant, etc. Businesses that process orders per day. Print shops, for example. Not for profits that work with clients and are required to work on cases on a daily basis. A disability resource center that provides accommodations and prepares Braille, captions or other services to its disabled clients. Organizations that work with volunteers, and need to track daily volunteers hours. Speaking of volunteers, seeing how busy certain days of the month get, this calendar can provide insights into when an organization should get volunteers to take care of busy/seasonal periods. You use this visualization in a Power BI dashboard which can be displayed in CRM for Dynamics 365! You don’t have to go to Power BI to look at this information. Here’s my Power BI dashboard displayed in Dynamics 365. This visualization shows only one month’s (the first month in your dataset) data. In order to go through other months, create a slicer and use it with this calendar. Does this visualization excite you? How do you plan to use it? Let me know in the comments below! Have other questions about Dynamics 365? Drop me a line! How about its use in a library ? What if I want to drill down to see one days schedule for multiple technicians? or one week for multiple techs? Or one week for one tech? within the days I would like to see what jobs they are working on (work order) and time they are / were scheduled for. i would like to be able to plan / schedule forward looking days/weeks in advance. i would also like to be able to look at past days/weeks. I haven’t found a customer calendar visualization that can do this.